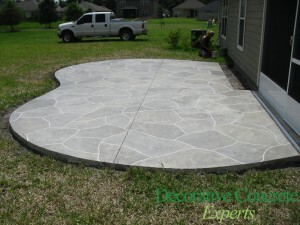 StoneCrete decorative concrete overlays are perfect for both new and existing concrete surfaces. The surface texture can give your concrete the look of natural stone at a fraction of the cost. This product gives us a wide range of flexibility in color with options ranging from vibrant acid stains, to softer water based stains. The surface can be done with a random stone pattern (shown at left), a custom pattern to suit your individual project, or no pattern if you would just like the surface texture without the simulated grout lines (shown below). The finish looks similar to stamped concrete and works in situations were stamped concrete may not be a viable option. 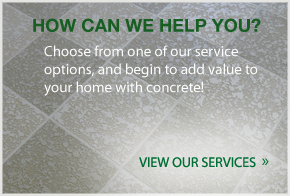 Let the experts bring your vision to life with StoneCrete. Contact us today today at 407-342-8552!